What language would/do you use to build a web application? To a regular reader of Hacker News, the results aren’t really surprising. Especially Python is very popular among users there. 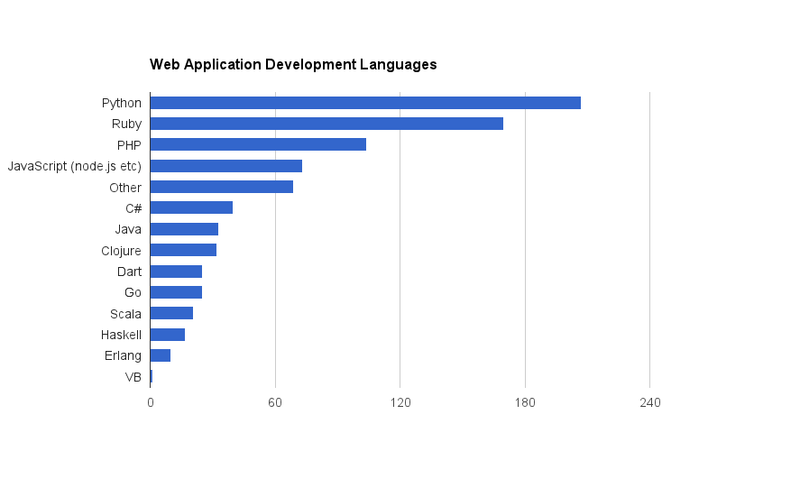 A little surprise at first sight may be that PHP came in so close to the top, at third place. When reading Hacker News, you could get the impression that everybody hates PHP. But I think that’s a very common misconception about PHP. Not many people hate the language, it’s just that the people who do tend to be very vocal about it. Also, I have no idea who the one person is that would/does use Visual Basic to build a web application, but I salute that brave soul. This entry was posted in Non-Photo Posts, PHP, Programming on June 27, 2013 by Jan Hapke.